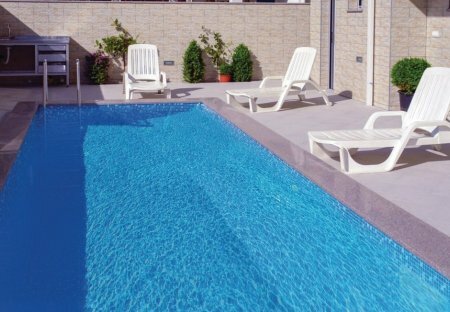 Rent apartments in Budva Riviera, Montenegro with swimming pools. Book affordable holiday rentals that are near a beach. This modern and well-equipped apartment is located in a residential building situated in the centre of Budva, which offers a variety of restaurants and bars. These four cosy and functional apartments are located in a peaceful area in the village of Krimovica. This apartment has one double bedroom. The apartment lies 15 m from the coast line in the second floor of an apartment building. A 12 m long terrace is connected to the living room and one of the bedrooms. The terrace offers a sea view. Situated on the ground floor and less than a minute walk to rafailovici sandy beach! Our holiday apartment is matchless for giving you that 'home away from home' feeling.